A conference on the institutional relations between the European Union and Armenia took place in the European Parliament yesterday. 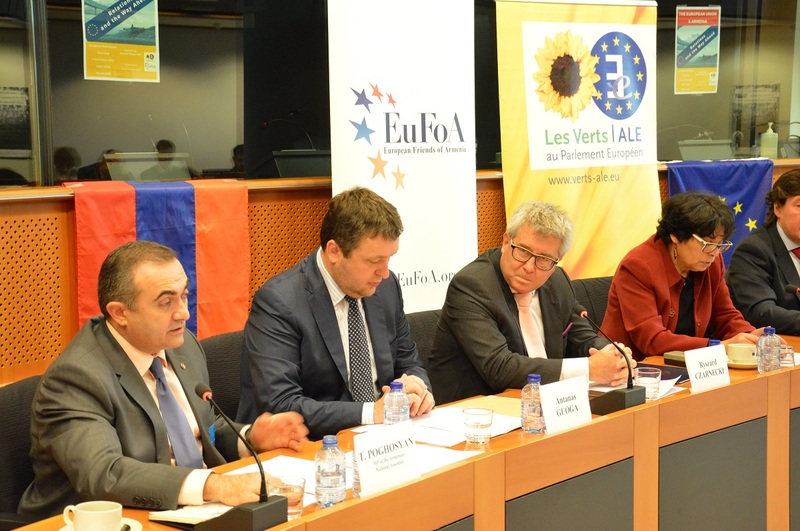 The event was jointly organized by MEP Michèle Rivasi and European Friends of Armenia. It featured a very diverse selection of keynote speakers, including the main officials that will be involved in the upcoming EU-Armenia negotiations that will start next week. The event was introduced by Michèle Rivasi, Vice-Chair of the Greens/ European Free Alliance group in the European Parliament. For many years she has been actively contributing to building stronger ties between Armenia and Europe. She is also a member of EuFoA’s Europe-Armenia Advisory Council. In her speech she underlined the importance of strong EU-Armenia relations. ´We share a lot of history with Armenia and I am thankful for what the Armenian culture has brought to our continent. It is very important to organize such an event because we want a better agreement between the European Union and Armenia.´ she said. ´I helped organizing this event so that we can all get a better understanding of the EU-Armenia relations. We hope to find solutions together with the politicians and also with civil society’. With this hearing EuFoA wanted to reflect on the achievements in EU-Armenia relations and feed the debate ahead of the new legal base for EU-Armenia relations that will be negotiated in the upcoming months. Eduardo Lorenzo Ochoa, EuFoA Director, is confident that this type of open discussions produce a wide range of ideas that properly implemented can develop further EU-Armenia relations. Armenia is a founding member of the EURONEST Parliamentary Assembly and its participation therein has always been highly valued by the European Parliament. In his contribution Ryszard Czarnecki, Vice-President of the European Parliament and Vice-Chair of EURONEST, reflected on the current state of Armenia-EU relations and how he hopes they will develop. Regarding the EU-Armenia legal basis, there is a growing consensus, both on the EU and the Armenian side on the need to upgrade it, as underlined during the Eastern Partnership (EaP) Summit in Riga in May this year. Taking into consideration that the current agreement was drafted in 1996, this new document should duly reflect how EU-Armenia relations have evolved since. ‘It is very important for Armenian to further develop its flourishing IT industry and energy sector in order to reduce its energy dependence’ said Mr Antanas Guoga, Vice-Chair of the European Parliament’s South Caucasus delegation. The conference was attended by about 50 people working in the European Institutions, international organizations, diplomatic community, and media. The closing words were provided by Armenian MP Tevan Poghosyan, who is also member of the EU-Armenia Parliamentary Cooperation and EURONEST Parliamentary Assembly.